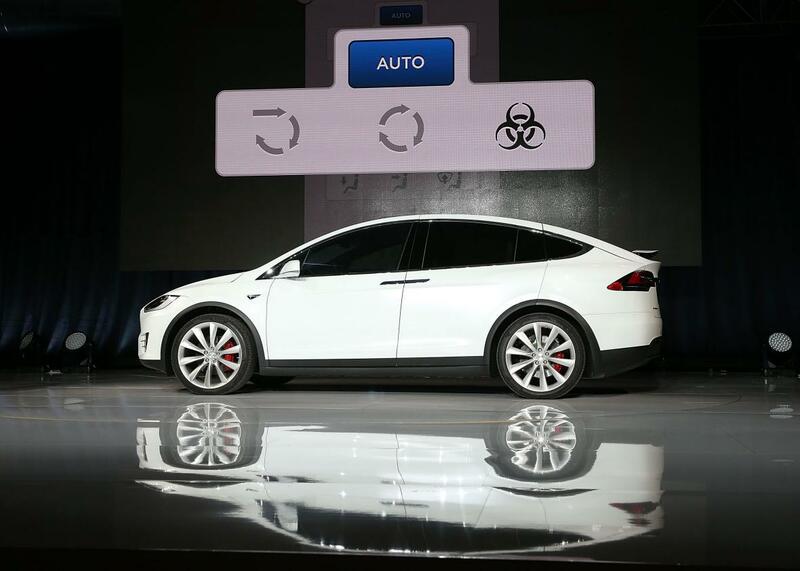 Tesla Model X's "bioweapon defense mode" is really about China, air pollution. 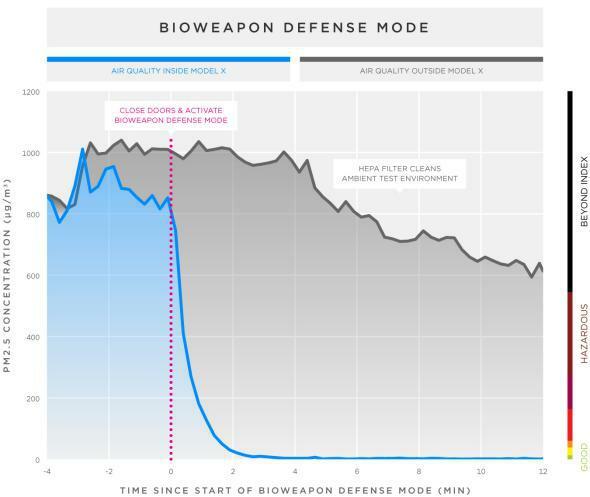 Tesla’s “Bioweapon Defense Mode” Sounds Like a Gimmick. It’s Actually Ingenious. Think air pollution. And China. But Musk wasn’t joking. And, far from being the Model X’s “most ridiculous feature,” as one tech blog dubbed it, bioweapon defense mode could end up being one of its biggest selling points in at least one key market: China. It isn’t that drivers in China are paranoid about bioterror attacks. It’s that many of them deal on a daily basis with oppressive air pollution, a major quality-of-life issue in some of the country’s largest cities. For China’s wealthy, the Model X may offer a haven from the smog that no other vehicle can match. Bioweapon defense mode, it turns out, is a bit of a misnomer. I mean, sure, you’d probably turn it on if you happened to be out for a drive when someone dropped a ricin bomb nearby. But the real purpose of Tesla’s hospital-grade HEPA cabin filtration system is to protect drivers from the more quotidian menace of pervasive air pollution. A Model X was placed in a large bubble contaminated with extreme levels of pollution (1,000 µg/m3 [micrograms per cubic meter] of PM2.5 [a harmful form of fine particulate] vs. the EPA’s “good” air quality index limit of 12 µg/m3). We then closed the falcon doors and activated Bioweapon Defense Mode. Air quality in the cabin went from deadly to fresh in two minutes. Within two minutes, Tesla says, the system had scrubbed the pollution in the vehicle’s cabin to the point that it was no longer detectable by the company’s sensors. The Model X’s passengers then removed their gas masks and breathed clean air. Perhaps you could, although bioweapons experts are skeptical that you ever would. For one thing, as Gizmodo points out, you’re unlikely to realize there has even been a biological attack until it’s too late. So, yes, the feature’s name is a marketing gimmick. Other luxury carmakers have installed high-tech air filters that didn’t get nearly this much attention. But the feature itself is not. As Tesla points out, the World Health Organization calls air pollution “the world’s largest single environmental health risk,” contributing to more than 3 million deaths each year. Recent studies have put that number even higher. Either way, it’s more than twice the global death rate from auto accidents. Even if it didn’t save or extend drivers’ lives, the system would still hold appeal as a luxury feature, blocking out unpleasant smells when you drive past a landfill or a skunk, or pretty much anywhere in California’s dung-filled Central Valley. Here’s a Tesla driver testing it out while driving through a polluted stretch of highway in Arizona. Granted, the video was made by a self-professed Tesla lover who won his Model X in a Tesla-sponsored referral contest. I hope to get a better idea of how well the feature works when I test-drive a Model X in the coming weeks. Regardless, the feature looks like another ingenious marketing maneuver by Musk—one that has a surprisingly serious purpose. And yes, when you turn it on, the fans go to 11.